Students engage in class at Kogod with Professor Nakshbendi. When students tell Professor Ghiyath Nakshbendi they are considering his Islamic Finance class because they’re interested in the Middle East or Islam, he turns them away. Nakshbendi’s Islamic Finance course isn’t about either of these topics. It’s about a particular philosophy of doing business—one that Nakshbendi believes offers an important counterpoint to Western business practices. The term “Islamic finance” refers to a system in which the concept of monetary interest—or riba— does not exist. Under traditional Islamic law, known as sharia, one cannot earn interest from lending money. Instead, one loans money to benefit not only the borrower, but the community—be it to build a school, or to purchase a home. Islamic finance is corporate social responsibility put into practice. But what happens if a borrower can’t repay a loan? “Contracts, contracts, contracts!” says Nakshbendi in his characteristically animated way. “We do our due diligence. The focus is on productive enterprises.” Nakshbendi believes this approach also provides an alternative method to the broken financial system the 2008 global recession created. The idea for the Islamic Finance class originated from “The Emergence of Islamic Financing,” a conference Nakshbendi hosted at Kogod in 2009. Interest and attendance was so high he knew he had tapped into a fertile topic. 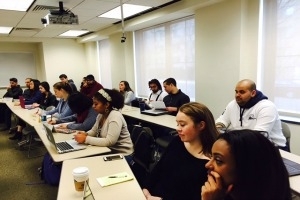 The course, established permanently in 2015 within Kogod, is the only class of its kind on the East Coast designed specifically for business school students. This past year, 26 students from all 7 schools at American University enrolled—both undergraduates and graduate students. The implications for the course, however, go well beyond the classroom. The Islamic Finance market is expected to grow to $3.4 trillion by 2018, with hubs in London, Singapore, Dubai, the United Arab Emirates, and Bahrain. At that time, it is estimated the market will need 50,000 trained professionals, making Nakshbendi’s Islamic Finance course a desirable commodity. A hallmark of the class is interaction with real-world practitioners, which have included academics from Qatar, bankers from Saudi Arabia, and local experts from the International Monetary Fund and elite law firms. “Visiting” lecturers Skype into the classroom to share their experiences, despite the fact that it may be the middle of the night in Middle East. Kogod’s Islamic Finance course is a first step in developing a curriculum around the topic. In partnership with Jeffrey Harris, Finance Department Chair, Nakshbendi is developing an Islamic Finance Certificate with a full set of Islamic Finance courses. In the spring of 2017, an Islamic Sukuk (or bond) class will be offered, in addition to Islamic Finance, one more piece of the budding program. “We see the Certificate as representing our strong commitment to a growing segment of financial professionals around the world,” says Harris. It doesn’t take a scholar to realize that Nakshbendi’s Islamic Finance class offers an invaluable academic experience to students. Immersion into a globalizing field, led by an experienced professor and practitioner, gives students a cross-cultural perspective that deepens and broadens their Kogod experience. “I looked forward to the class every week. I’d take it again if I could,” says Balobaid.